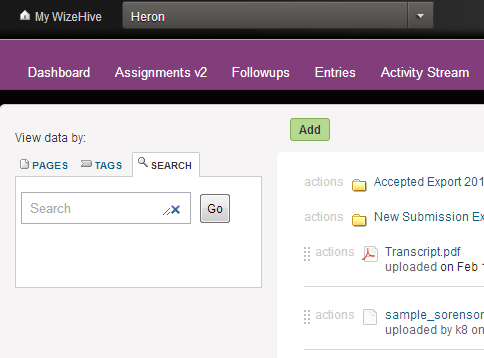 In WizeHive, form entries are called Pages. Pages are automatically named based on fields in the form. For web forms one field can be selected as the page name. 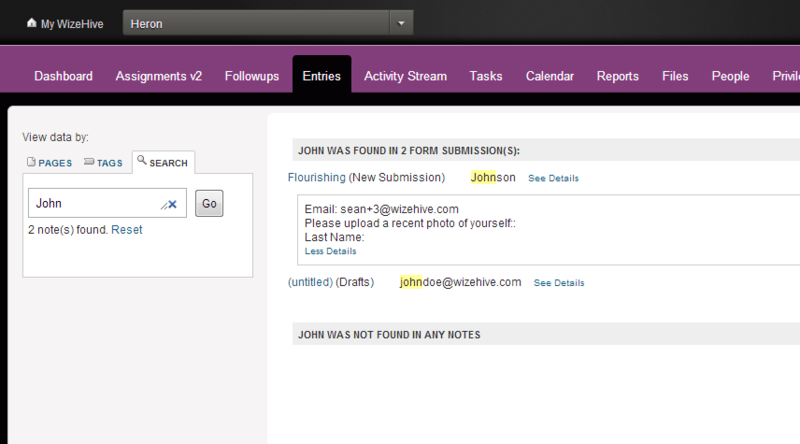 For application and advanced cart forms, two fields can be selected to be utilized as the page name. 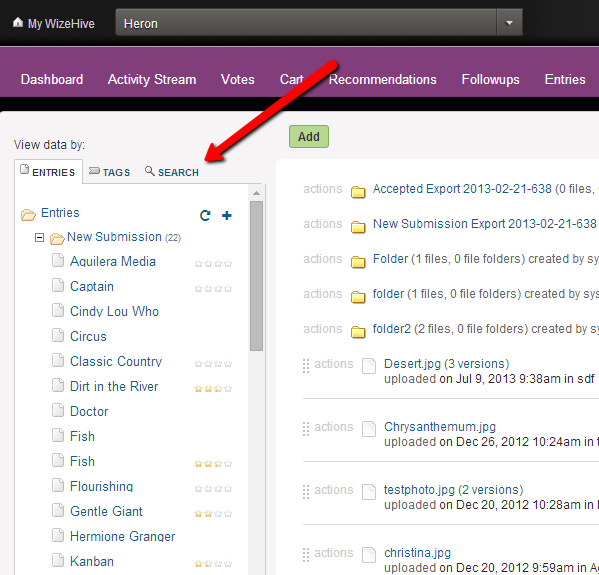 On many of the WizeHive tabs you will see a Sidebar. The Sidebar is a display of entries, tags, and search. Within the sidebar, you will find the Page list, folders list, and configurations that are specific to the pages. In the right corner of the sidebar, you will see a small plus sign. This is a quick shortcut to create a page. This button will bring the form up and you can enter and save information here. After you click save, the page will be visible in the record list. Next to the ‘Add Page’ button there is a refresh button. This will update the list to reflect the latest changes. Please note that you can only add a page in this way if you are using a webform; to add a new page to an application form, you must access the form as an applicant and create a login username and password. Under that plus sign icon, there is a quick shortcut to "Add a Folder". This button will bring up a window that will allow you to name a new folder. Folders allow you to group related pages together. Under the plus sign icon, select “Manage Folders”. On the “Manage Folders” window you will have the option to delete, rename, or move each of your folders, or to create a new folder. To delete a record on the Manage Folders window, click “Delete”. A confirmation window will pop-up. Click OK. (NOTE: Deleting a folder will not delete the contents within that folder. The content would simply move to a new temporary folder called "Uncategorized." To rename, press "Edit." To move your folders, you can drag and drop the folders listed. Finally, to create additional folders, click "Add Folder." Pages can be moved between folders manually by the administrator. In order to do this, while on the data tab, click the name of the application in the folder panel. 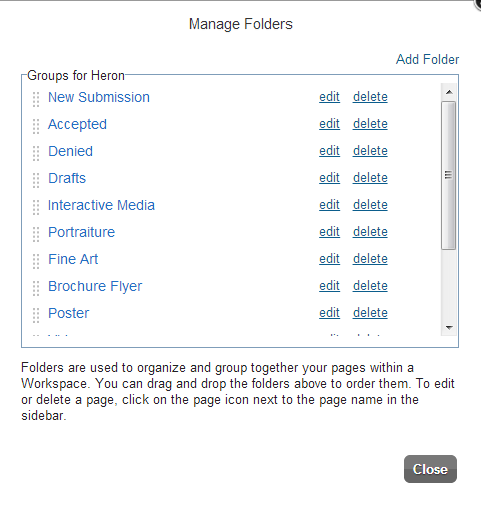 Above the application, you will see a Move To button; when clicked, it will show the names of folders in the workspace. Select the folder you'd like to move the application to; upon clicking, it will move. There are two statuses in WizeHive which are built into the system and inherently affect how an applicant interacts with an application: Submitted and Draft. By default, applications, once created, appear in the Drafts folder, and thus have a draft status. Anything in the Drafts folder is viewed as the system as unsubmitted/incomplete and is editable by the applicant. 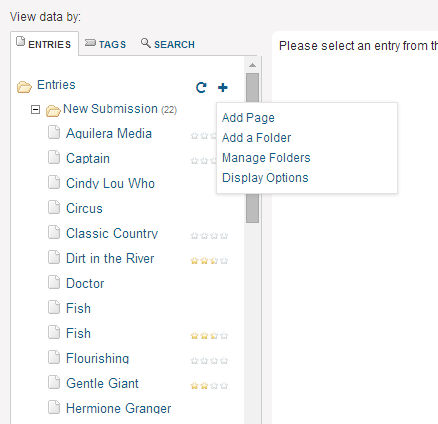 When an application is submitted, the application moves into the Submissions folder. At this point the application is viewed by the system as complete, and it is no longer editable by the applicant. If you would like to give an applicant access to a submitted application such that it is editable again, you can manually move the application back to the Drafts folder. However, the reverse is not true: if a draft application is moved to the Submissions folder by an administrator, it does not become submitted/complete. Please note that the above does not work for Advanced Cart. Tags are a non-hierarchical keyword or term assigned to a piece of information (such as a record). This kind of metadata helps describe an item and allows it to be found by browsing or searching. Tags are generally chosen informally and personally by the item’s creator or by its viewer, depending on the project. Tags can be utilized to create a sub-list or grouping for easy record reference. Enter the information that you wish to search on, which will be searched within a record or within a record name. You can create an advanced search by going to the Reports tab and creating a special report titled “*search results”. You can select available fields to appear on this report. Add the view with the name “*search results”, add the fields, and then save the new view. You can now use this new view as part of your Search. Go to the Data Tab and select “Search”. In the Search field, enter the data you are looking for as you normally would, and select “Go”.